Researchers are creating a citywide network to detect and track influenza. 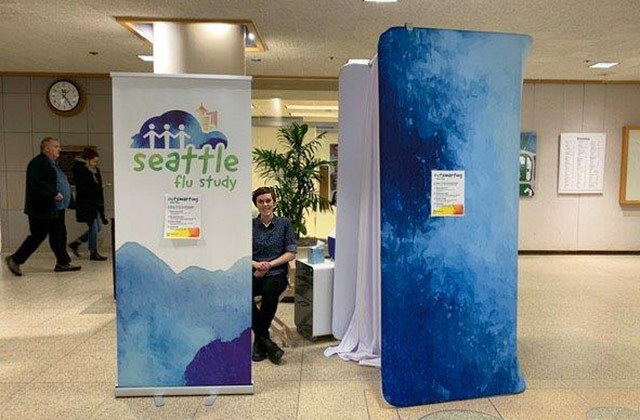 Flu study kiosk in the UW Health Sciences Building lobby. Adults and children can drop by and get their noses swabbed if they think they have flu symptoms. The Brotman Baty Institute for Precision Medicine has announced the launch of the Seattle Flu Study to better understand how influenza and other contagious diseases spread, and to gather information about how they might be better detected, monitored and controlled. The study will recruit 10,000 Seattle residents and visitors who show cold symptoms in the current season. The project will create a first-of-its-kind citywide network for infectious disease tracking. Volunteers who agree to participate at one of the designated kiosks will be asked to provide a simple nasal swab as well as basic personal and health information. Pathogens found in the samples will undergo genetic sequencing and be compared genetically and geographically. These analyses will help researchers to better understand how illnesses spread throughout the community. University of Washington Magnuson Health Sciences Center, 1959 NE Pacific St.
Hutch Kids Child Care Center, 1210 Valley St. The study emerged from a collaboration between the Brotman Baty Institute’s co-founders at UW Medicine, Seattle Children’s and Fred Hutchinson Cancer Research Center. To learn more, visit the study website. For details about UW Medicine, please visit http://uwmedicine.org/about.